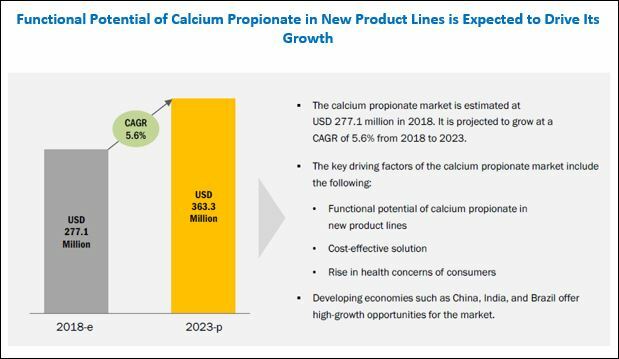 [110 Pages Report] The calcium propionate market was valued at USD 262.4 million in 2017; it is projected to grow at a CAGR of 5.6% from 2018, to reach USD 363.3 million by 2023. The base year considered for the study is 2017 and the forecast period is from 2018 to 2023. The main objective of the report is to define, segment, and project the global market size for calcium propionate on the basis of form, application, and region. 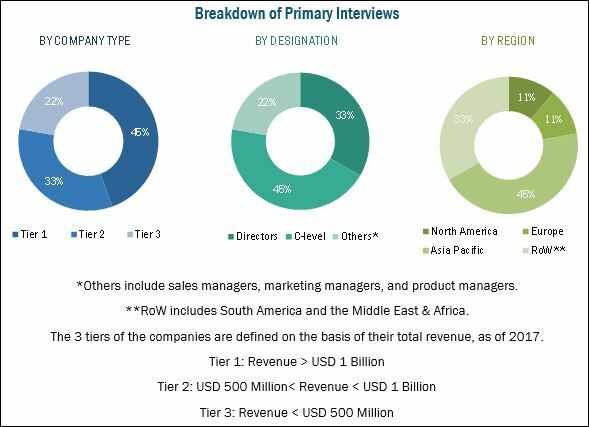 It also aims to facilitate the understanding of the structure of the calcium propionate market by identifying its various segments. The other objectives include analyzing the opportunities in the market for stakeholders, providing a competitive landscape of market trends, analyzing the macro and micro indicators of this market, and projecting the size of the calcium propionate market and its submarkets, in terms of value as well as volume. This report includes estimations of the market size in terms of value (USD million) and volume (KT). Both the top-down and bottom-up approaches have been used to estimate and validate the size of the calcium propionate market and to estimate the size of various other dependent submarkets. The key players in the market have been identified through secondary research; some of these sources are press releases, paid databases such as Factiva and Bloomberg, annual reports, and financial journals; their market shares in respective regions have also been determined through primary and secondary research. All percentage shares, splits, and breakdowns have been determined using secondary sources and verified through primary sources. The figure below shows the breakdown of profiles of industry experts that participated in the primary discussions. The key participants in the calcium propionate market are manufacturers, calcium propionate manufacturers, distributors & suppliers, associations and industry bodies, and end users. Niacet (US) ADDCON (Germany), Impextraco (Belgium), and Macco Organiques (Canada) are some of the leading players in the global calcium propionate market. The calcium propionate market is projected to grow at a CAGR of 5.6%, to reach a value of USD 363.3 million by 2023 from USD 277.1 million in 2018. Preservatives are the basic requirements that prevent the spoilage of food & feed, ensuring safe products to consumers. The preservation of food and feed products and maintaining their quality are the major areas of focus for associated industries globally. Bakery products and feed have been dominant applications for calcium propionate over the last decade. The key function of calcium propionate is to counter the growth of microbes on various bakery products that are prone to spoilage by bacteria. On the basis of application, the food segment is estimated to dominate the calcium propionate market in 2018. Calcium propionate is highly used in bread in the food industry. The growth of the bread industry, especially in the developing economies, owing to high per capita bread consumption, fuels the demand for calcium propionate. The feed segment is projected to grow at the highest CAGR during the forecast period. The demand for feed in developing regions is expected to grow along with the increase in livestock production. The increased demand for quality feed products with extended shelf life has propelled the growth of the market for calcium propionate in the feed. On the basis of form, the dry segment accounted for the largest market share due to factors such as ease of mixing and better dispersion throughout the food matrix. Additionally, dry calcium propionate does not affect the leavening action of baking powder in bakery products. Furthermore, dry form has a longer shelf life, facilitates better dispersion throughout the food matrix, and enhances flavor. 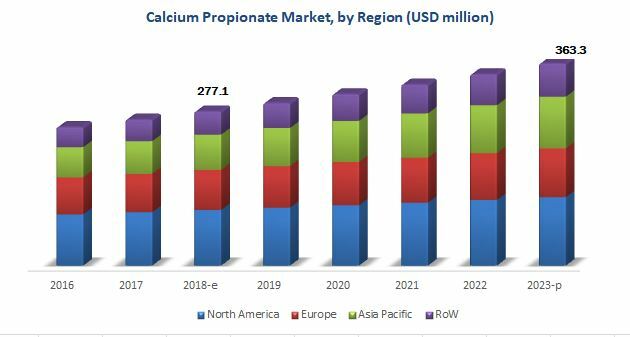 The North American region accounted for the major market share for calcium propionate between 2018 and 2023. This region is one of the largest consumers and exporters of calcium propionate due to the wide and matured bakery market and high bread consumption. The market for calcium propionate in North America is fairly matured; hence, growth in this region is moderate when compared to other developing economies. Consumers with busy lifestyles in the North American market are on the lookout for minimally processed foods with a longer shelf life. The increase in demand for convenience foods is expected to create an impact on the calcium propionate market in North America. Niacet Corporation (US) and Macco Organiques (Canada) are the key players in the region and serve various other markets. Asia Pacific is the second-largest market for calcium propionate after North America in 2023, owing to the increased awareness about calcium propionate and the benefits offered. It remains one of the important markets for calcium propionate manufacturers due to its size and its regulatory environment. The Middle Eastern & African countries are increasingly adopting calcium propionate due to changes in consumer lifestyles and increasing demand for fresh products. Feed preservation has also been exhibiting a remarkable growth due to its commercialization in several regions. As the food and feed industries are inter-linked, there is a need to provide animals with nutritional, high-quality feed so as to ensure that they consume safe products and are not affected by various infections. Apart from preservatives, calcium propionate is also used for the treatment of milk fever. However, the rise in demand for preservative-free, natural food products could act as a restraining factor for the growth of this market. The calcium propionate market is dominated by major players such as Niacet (US), ADDCON (Germany), Impextraco (Belgium), and Macco Organiques (Canada). *Business Overview, Products Offered, Recent Developments, Might Not Be Captured in Case of Unlisted Companies.